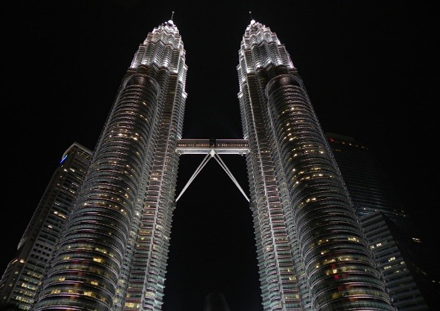 Registration is now available for those who wish to attend VTC2019-Spring in Kuala Lumpur! Please go to this link http://www.cvent.com/d/tbqb2z to begin registration. While registering, you may want to consider attending one of our many engaging workshops. Additionally, we have secured a diverse selection of tutorial offerings that you may choose to attend. We have included a list of workshops and tutorials below and more details are available on the conference and registration websites. 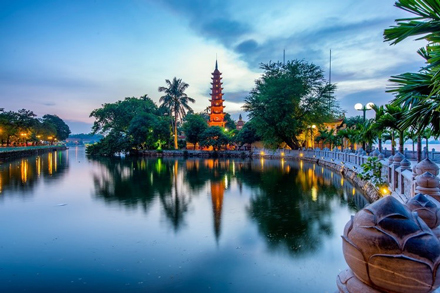 Our current open calls for papers are for VTC2019-Fall in Honolulu and VPPC 2019 in Hanoi. 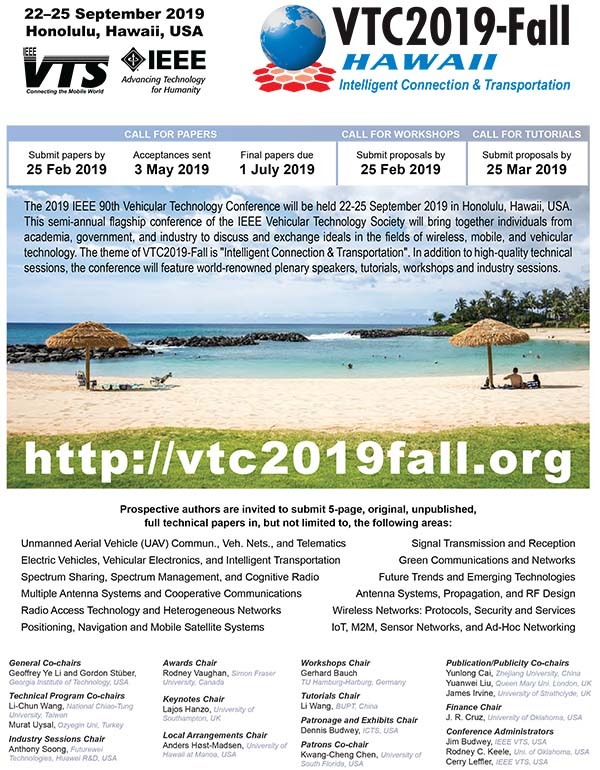 For the second year, the VTS Connected and Automated Vehicles Symposium (CAVS) will be held in conjunction with the fall conference, VTC2019-Fall in Honolulu. Stay tuned for more details on this opportunity as well. Finally, if you have ever wanted to host a VTS Conference and feel your community would be the perfect location and support system, we encourage you to see the advertisement below and contact the VTS Conference Administration for more information. T8: Wireless Networks Design in the Era of Deep Learning: Model-Based, AI-Based, or Both? IEEE CAVS is a symposium for reporting advances in all aspects of CAVs, including theory, tools, protocols, networks, applications, systems, test-beds and field deployments. The 2nd IEEE Connected and Automated Vehicles Symposium will be co-located with IEEE VTC2019-Fall. The IEEE Vehicular Technology Society’s Conference Committee invites the submission of proposals to host VTC events starting in Fall 2020 and 2021. The fall iteration of VTC is normally held in North America, so submissions should be in keeping with that tradition. But note that all proposals, even those for other areas and dates, will still be considered. Individuals, groups or organizations interested in hosting an IEEE Vehicular Technology Conference should first contact VTS VP—Conferences J. R. Cruz to express their ideas. 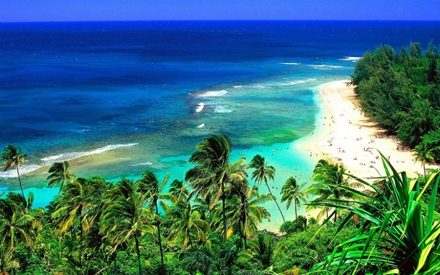 A show of interest should include a description of the location and why it would be an attractive venue to visit, possible dates, a plan for the organizing committee, potential theme, local accommodations and other travel information. Any cost benefits or sponsorship potential should also be mentioned. Pictures of the proposed location are encouraged as well as a list of recent conferences held in the area. Following initial discussions, promising candidates will be sent a proposal packet to further prepare for formal consideration by the Conference Committee and, if approved, for final acceptance by the VTS Board of Governors. For the latest conference listings, visit the IEEE VTS Conference Calendar. To ensure delivery, please add vts@ieee.org to your email address book or Safe Sender List. If you are still having problems receiving our emails, see our whitelisting page for more details.